2. Unroll one pie crust onto a lightly floured surface and set your pie plate onto the crust. 3. Using the pie plate as a pattern, cut around the bottom of the pie plate with a butter knife. (This will form the middle crust in your pie/cobbler). 4. Place this circle onto a baking sheet lined with parchment paper, waxed paper or aluminum foil. 5. Place this on the center rack of the oven and bake until the pastry is dry and lightly browned and developing small bubbles on the surface – about 10 minutes. 6. Set this pie crust aside to cool. 7. Into a pie plate, place one refrigerated pie crust and allow the extra to hang over the edges. 8. Unroll the final pie crust onto a lightly floured surface and cut into 1 ½ inch wide strips. 9. In a small bowl, combine the sugar and the flour and set aside. 10. Stir the vanilla into a ¼ Cup of water. 11. 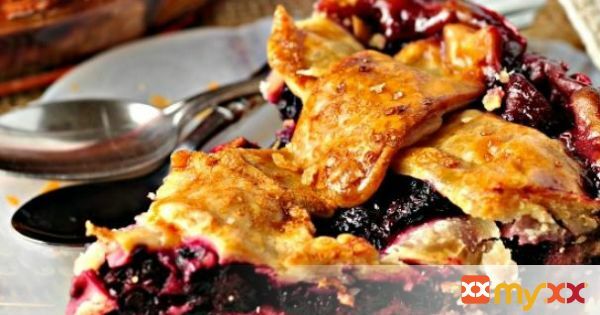 Scatter ½ of the blackberries into the the bottom pie crust that is in the pie plate. 12. Sprinkle half of the sugar mix over the berries and half of the water mix over the berries. Scatter ½ of the butter chunks onto the berries as well. 13. Placed the prebaked pie crust on top of the berries and repeat step 5 above, scattering the remaining berries, sugar, water and butter. 14. Using the strips of cut pie crust, weave the top of the pie crust. 15. Wetting your fingers with water, dampen the underside of each strip where it will attach to the bottom pie crust and pinch together. 16. Going around the pie plate – crimp the bottom edge and top edge together. 17. Using a pastry brush, brush the top of the pie with the beaten egg. 18. Sprinkle with the Raw Sugar. 19. Place the pie on a baking sheet to catch any drips and place on the bottom rack of the oven. 20. Bake for 10 minutes at 450 and then reduce heat to 350 for another 45 minutes or until the filling is juicy and bubbling up through the pastry strips. 21. Place on a cooling rack or folded kitchen towel and let cool for at least 20 minutes. 22. Serve warm or at room temperature.